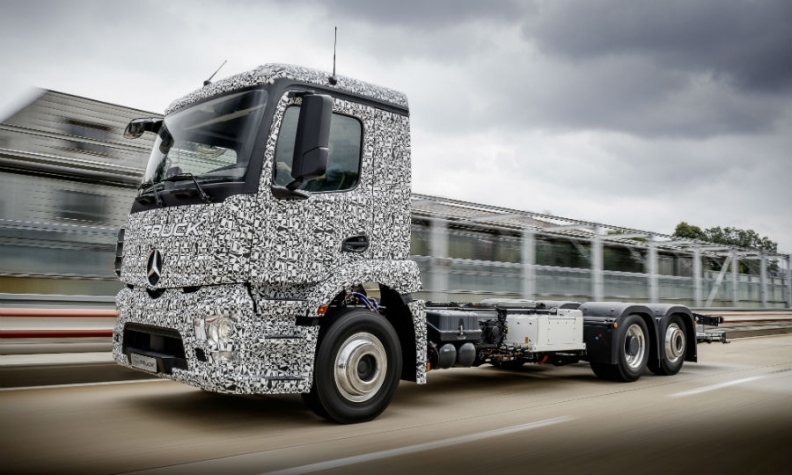 MUNICH -- Mercedes-Benz outlined plans to start selling an electric heavy-duty truck in about five years, a week after Tesla Motors' initial sketch on battery-powered commercial vehicles failed to impress investors. The Mercedes-Benz Urban eTruck will have a range of about 200 kilometers (120 miles) per battery charge and capacity for loads of as much as 26 metric tons, parent company Daimler said today in a statement. The model, targeted for inner-city tasks such as supermarket deliveries, could go on sale by the start of the next decade, it said. Sales of electric versions might account for 4 percent of European Union and U.S. medium- and heavy-duty truck sales by 2025, according to IHS.